All photos courtesy of Hotel Único Madrid​. MADRID – Along Calle Claudio Coello, a street named for the famous 17th-century Spanish Baroque painter in Madrid's Barrio de Salamanca neighborhood, palatial residences that once housed Spanish aristocrats stand the test of time. Some remain inhabited by the Spanish elite (this is, after all, some of the most expensive real estate in the city); others have since been converted into foreign embassies, luxury clothing stores, posh art galleries, and Hotel Único Madrid, a stately, glamorous, and sophisticated property befitting of such an address. 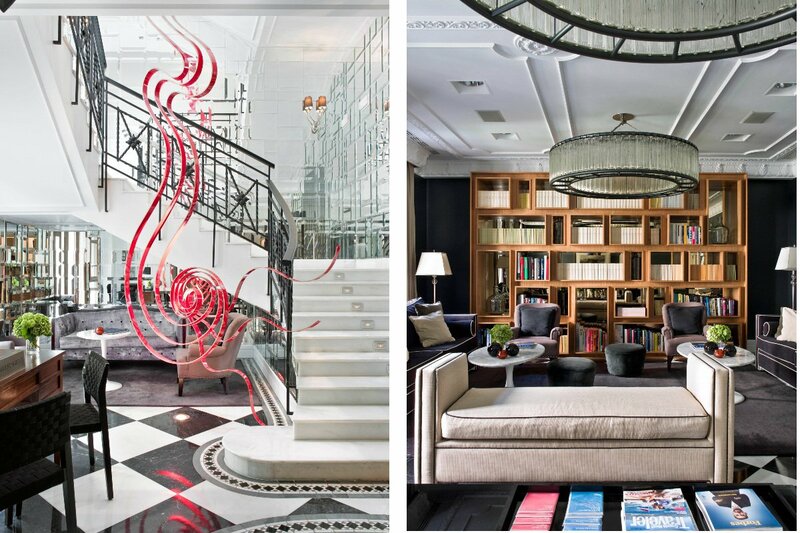 The boutique hotel is located inside a restored 19th-century palace, where everything from the classical facade (a city landmark) to the regal main staircase, a contemporary restoration completed by artist Jacinto Moros, continues a legacy of refinement. Style: Peaceful and elegant. 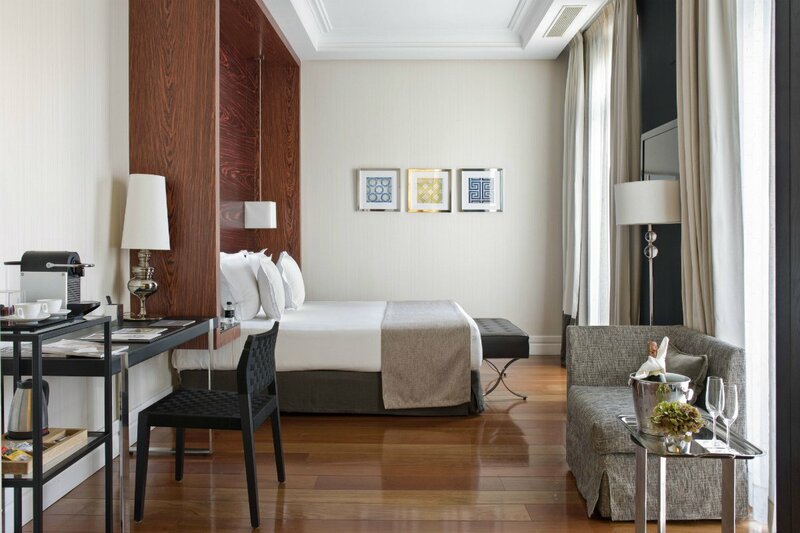 Tucked away in the Barrio de Salamanca, an upper-class and largely residential neighborhood north of the city center, the hotel is insulated from large crowds and chaotic urban energy. The design — discreet, tasteful, comfortable — reinforces this intimacy. 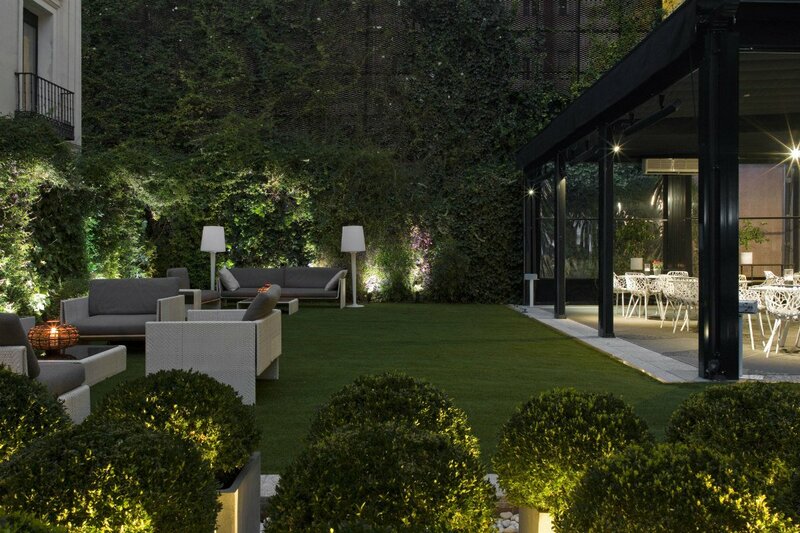 Standout Detail: The hotel's private backyard garden. Walls of sprawling ivy and jasmine enclose an outdoor lawn, complete with elegant lounge furniture on which guests can take breakfast and unwind in the comfort of this secluded urban oasis. This Place is Perfect For: Travelers seeking the finer pleasures in life. With a two-Michelin-starred dining option on site and luxury retail like Manolo Blahnik, Miu Miu, Hermes, Chanel, and Gucci (to name a few) just a block away, you can strike “budget” from the vocabulary. Rooms: 44, including several suites. 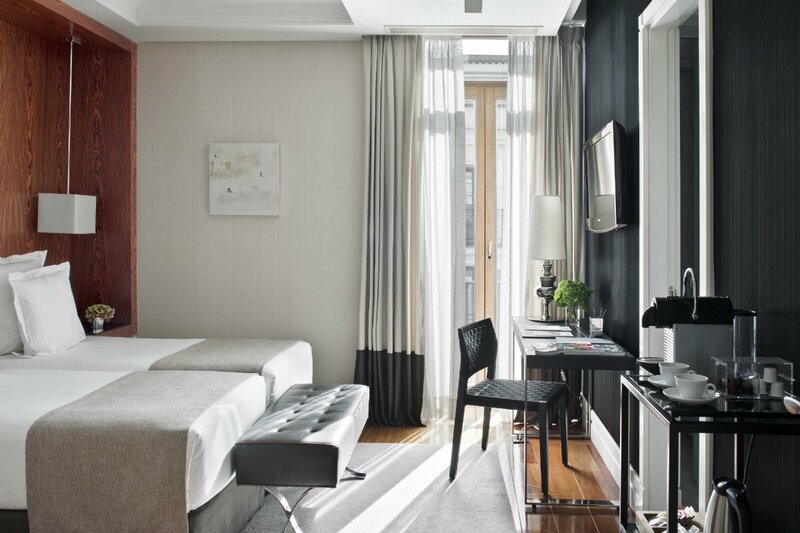 Light pours through floor-to-ceiling windows, transforming masculine spaces furnished with dark accents, exposed hardwood, and pale earth tones into bright guest rooms. The design is modern and sleek, which can also be said of the bathrooms, each with a bathtub, hydro-massage shower, and intricate mosaic tiling. WiFi, LCD TVs, a stereo system, a fully-stocked mini bar, and lighting and climate controls come standard. On Site: An executive meeting room, private garden, valet parking, TechnoGym-equipped fitness center, wellness suite offering an array of spa and beauty treatments, library, and 24/7 room service. Babysitting, personal training, and personal shopping services are available upon request. 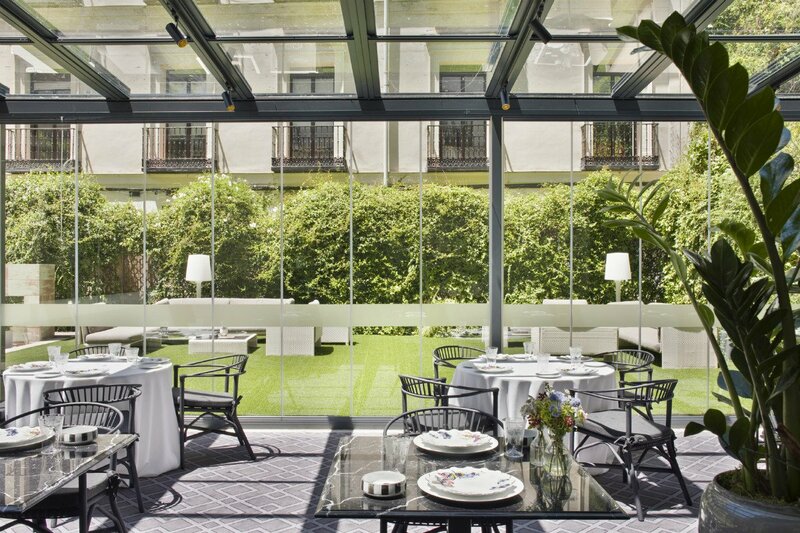 Food and Drink: At the hotel's on-site restaurant, Ramón Freixa Madrid, visionary head chef Ramon Freixa puts an imaginative spin on traditional Catalan cuisine, for which he has been awarded two Michelin stars and numerous other accolades. The à la carte and tasting menus change seasonally, and the wine list is extensive. 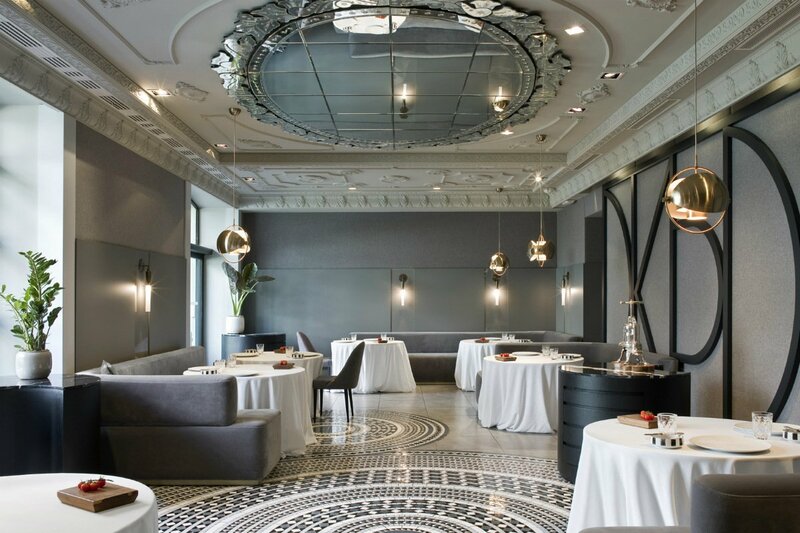 The dining room, which is connected to a glass pavilion overlooking the hotel's garden, makes for an intimate setting. Rates change seasonally and start at $280/night. Click here for reservations, or email the Fathom Travel Concierge and we'll book the trip for you. Located in the upscale Barrio de Salamanca, arguably Madrid's priciest neighborhood, guests have access to one of the most exclusive shopping, dining, and residential districts in the city. The area is home to four of Madrid's fourteen Michelin-starred restaurants, museums such as Museo Arqueológico Nacional and Museo Lázaro Galdiano, and the famous Parque del Retiro. Lose yourself along the glamorous milla de oro (the golden mile), named for the many designer fashion boutiques that line its streets or visit some of the capital's most influential art galleries. Madrid's more familiar sites, like the Museo del Prado and the Reina Sofia, are just a short car or bus ride away.